This is the story of my first HG pregnancy. Danny and I got married in December of 2008. He left for a deployment to Africa in April of 2009. He was gone for seven months! It was such an emotionally challenging time to be away from each other as newlyweds for more than half a year. A lot of emails, phone calls, video-chatting and many prayers helped us to survive the deployment. When he came back in November of 2009, we decided to wait to have kids till we settled down as a couple. A year later, we made the decision to forgo contraception. We weren’t preventing pregnancy but we weren’t really actively trying either. When I missed my period in November of 2010, I decided to take a pregnancy test – just in case. I really didn’t think I would actually be pregnant…but there I was holding a positive pregnancy test in early November 2010 (on Veterans Day)! Danny was pretty excited. Me…I was just shocked. The nausea wasted no time rearing its ugly face into my life. It started out slowly…what you might call normal morning sickness. I was still able to eat and function. Then the nausea kicked into full-force and slammed me with an overwhelming sickness that I was totally unprepared for. I knew that I would have some nausea because my mom had a lot of morning sickness with her pregnancies. But I had no idea how bad it would get. The nausea and vomiting got worse and worse day by day. Eventually, I couldn’t eat anything without throwing it back up. I remember my mom being so concerned with my eating and like any Korean mom would, she kept pushing me to eat despite the nausea. I would get frustrated and tell her – “You don’t understand, I can’t eat because I’m so nauseous and I’m going to throw it up anyway so what’s the point?” This was the daily battle I struggled with. Every part of my body was screaming nausea and telling me not to eat. At the same time, I knew I should try to eat for the baby’s sake. But inevitably, whatever I ate would come back up. I told my OB about my excessive nausea. She told me it’s normal morning sickness in the first trimester and that it would get better soon. A week later, I called my OB nurse and complained about my nausea and vomiting. She said – as long as you’re keeping fluids down, it’s fine. It just got worse. Not only could I not eat, I couldn’t keep liquids down either. So I decided to go to urgent care one day when I was feeling horrible. They told me I was dehydrated and gave me fluids via IV. The doctor said, “You have something called hyperemesis which means you have excessive nausea and vomiting. There isn’t much we can do. Here’s some information about HG.” I felt a bit better after receiving the IV fluids but they sent me home soon after with a prescription for Zofran (anti-nausea medication). The Zofran did not work and I was back to vomiting multiple times a day. This continued for days. I decided to go to urgent care again since nothing was working. This time we waited three hours in the waiting room to be seen. I remember sitting in the waiting room and just wanting to die because the nausea was so strong. I silently cried because I was so frustrated and tired of waiting. I think the people in the waiting room probably thought I was crazy or something. I was seen again and given fluids via IV and again immediately sent home. Literally the moment I stepped back into the car, I threw up again – just the smell of the car caused me to retch. The around-the-clock vomiting continued again for days. I expressed my concerns and frustrations to her over the phone – between pathetic sobs. She told me to go to the ER. I asked her – “Well, will they admit me?” She said “I don’t know.” I was so frustrated at that point and wondered if it would even be worth it to go to the ER. But in my heart, I knew something was wrong and if I continued going like this, I would just die. So we went to the ER on Christmas day. Thankfully, there weren’t too many people there and I was seen quite quickly. The doctor gave me Phenergan (another anti-nausea med) via IV and it made me so sleepy – I loved it! Something to finally take the nausea away. They ran some blood tests and the ER doctor consulted with my OB and they concluded that I should be admitted because the numbers from the blood tests were off. I think my electrolyte level was really low due to the dehydration. I was so happy to hear that someone finally was taking my condition seriously! I stayed in the hospital for about four days. I was on continuous IV – getting fluids as well as Zofran and Phenergan. I was still throwing up but at least the fluids were keeping me from being dehydrated. When my OB came to see me, she had a totally different attitude. She clearly didn’t think this was ‘normal’ morning sickness anymore. She wanted to do an ultrasound to make sure the baby was okay. The baby turned out to be perfectly healthy and quite active! My OB decided to have me to get a PICC line for long term in-home IV treatment. A PICC line is a peripherally inserted central catheter. It is a long, slender, flexible tube inserted into a peripheral vein, typically in the upper arm and advanced until the catheter tip reaches into a large vein in the chest near the heart to obtain IV access. Because I would be receiving IV treatment daily 24 hours a day, it would be a hassle and also difficult on my veins to change the IV site every week. With the PICC line, you don’t have to get pricked every week for the IV treatment. I loved my PICC line! It was truly a lifesaver. I received IV treatment for a month. A home health nurse would come every week to change the dressing and check up on me. The rest of the time, Danny changed my IV bags and administered the medications into the PICC line for me. He was a pro! His navy medical training definitely came in handy. He already knew how to administer an IV so it was a piece of cake for him. After a month of continuous IV treatment, I finally started to feel better and could start eating again. By the end of my first trimester in January, I started to feel somewhat normal and I gained my weight back. I still had nausea 24/7 but it was at a much more manageable level and the vomiting significantly reduced. That was my traumatic introduction to HG. I was forced to take three months of sick leave from my job. I went back to work in February and thankfully, the rest of my pregnancy went more smoothly. My labor and delivery – compared to my pregnancy – was so easy. I was actually kind of surprised at how smooth and fast my labor and delivery was. My water broke at 7 am on July 13th, 2011. I called the hospital and they told me to take a shower, eat breakfast and head over to the hospital in a couple hours. So I took my time and showered and ate some cereal. I started feeling sharp contractions and we drove to the hospital. By 9 am, the nurse measured me and I was already 6 cm dilated! (I had been dilating even before labor started) The nurse told me I could get the epidural then since I was already 6 cm or that I could wait. I decided to just get the epidural because the contractions were quite painful. The anesthesiologist was wonderful and the epidural was wonderful! Now I was in no pain and just waited to push. By 2 pm, I was fully dilated at 10 cm. I threw up a couple times (of course!) during the pushing. I pushed for a couple hours and Annelise was born at 4 pm! She weighed 8 lbs 5 oz! The doctor was amazed at how big she was. My OB told me I was the worst case of nausea/vomiting she had seen. The best part about delivering the baby was of course meeting Annelise finally but also the fact that my nausea was finally and completely gone! Food never tasted so good as when I ate the hospital food that day. I’m still amazed at how big and healthy Annelise is despite the HG. Annelise means “grace.” It was truly by God’s grace and many people’s prayers that I survived my first pregnancy and that Annelise was born full-term at a very healthy weight and that Annelise is such a good eater! 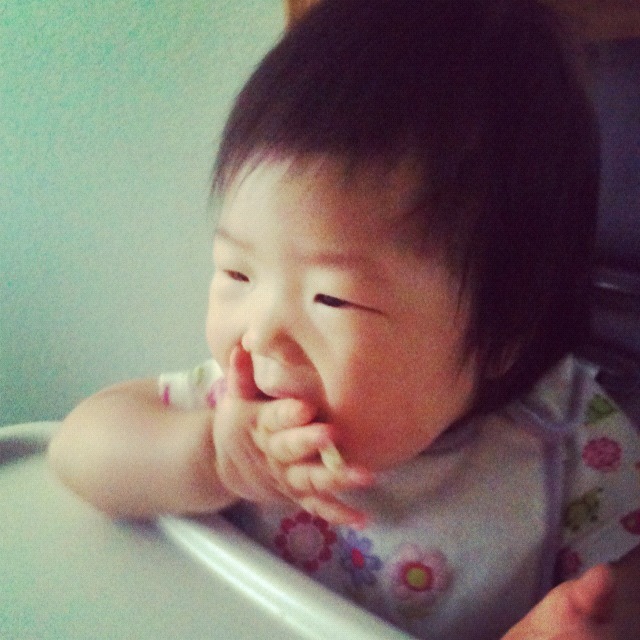 Here’s a picture of my little chub-chub doing her favorite thing…eating! Annelise is adorable! With a champ like her mama I’m sure she’ll grow up physically healthy and emotionally strong.